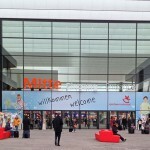 International Toy Fair in Nuremberg Germany runs from January 28th through February 2nd this year and the travel plans have been in place for a few weeks. Enter the weatherman and a prediction for massive amounts of snow and a blizzard to consume the northeastern US. Flight cancelled, flight rescheduled through Charlotte NC, train cancelled, second flight cancelled. What to do? This entry was posted in News and tagged adventure, Europe, Nuremberg on January 30, 2015 by Randall Hertzler. 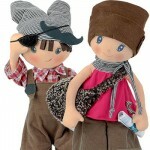 Paul and Paula are soft cloth dolls perfect for toddlers 1.5 years and older. What better way to have an adventure than with dolls designed for adventure! Their whimsical faces keep you smiling. What adventures might they have in your house? This entry was posted in Giveaway and tagged adventure, soft dolls on November 18, 2014 by Kathryn Hertzler. Paula and Paul have been hobnobbing around New York city on an incredible adventure for two soft dolls from Germany. By now you've guessed they are at the Vogue photo studio at Condé Nast Publications. Today the digital article in which they appear has gone live at vogue.com. This entry was posted in Products and tagged adventure, New York, soft dolls, Vogue on August 21, 2013 by Randall Hertzler. We left Paul and Paula at 4 Times Square, New York, on August 6th. They are on an adventure that has included a train ride, exploring Grand Central Terminal, fun at Rockefeller Center, a chance meeting of the "Today Show" staff, and taking in the vistas of Times Square. This entry was posted in Products and tagged adventure, New York, soft dolls on August 9, 2013 by Randall Hertzler. 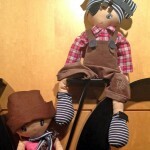 Paul and Paula are two new soft cloth dolls with an adventure theme. As luck would have it their adventure in the USA started with a request for a photo shoot at 4 Times Square in New York City! So we took the first dolls to arrive in the USA to NYC in person. This entry was posted in Products and tagged adventure, New York, soft dolls on August 7, 2013 by Randall Hertzler.